Hi Guys! I am Kinpatsu. I’m a cosplayer from Johannesburg , South Africa (Yes, Africa XD ) and I’ve been cosplaying since October 2012. I’ve always been a huge fan of gaming and anime as well as art, I’ve been drawing from the time I knew how to pick up a pencil, so for me cosplay was a way to bring all the things I loved most together in a creative way. The support from Patreon allows me to devote my time to cosplay and creating new costumes and content much faster. Because of patreon I am able to create at least one costume every single month, sometimes more! It also means I’ll be able to spend more time creating more helpful content like cosplay tutorials in order to help other cosplayers with their own costume creation. Step 2: You can then finalize your pledge and checkout! Payment will be instant and your pledge will be logged, even if you delete your pledge during the month. Step 4: At the end of the month the rewards will be sent out via patreon messenger! I will make a post when the rewards are sent! PLEASE NOTE : Sometimes life happens and rewards may be delayed by a few weeks. But even if they are late you will ALWAYS get what you pledge for. My Patreon is centered around teaching and providing resources for other cosplayers and crafters. 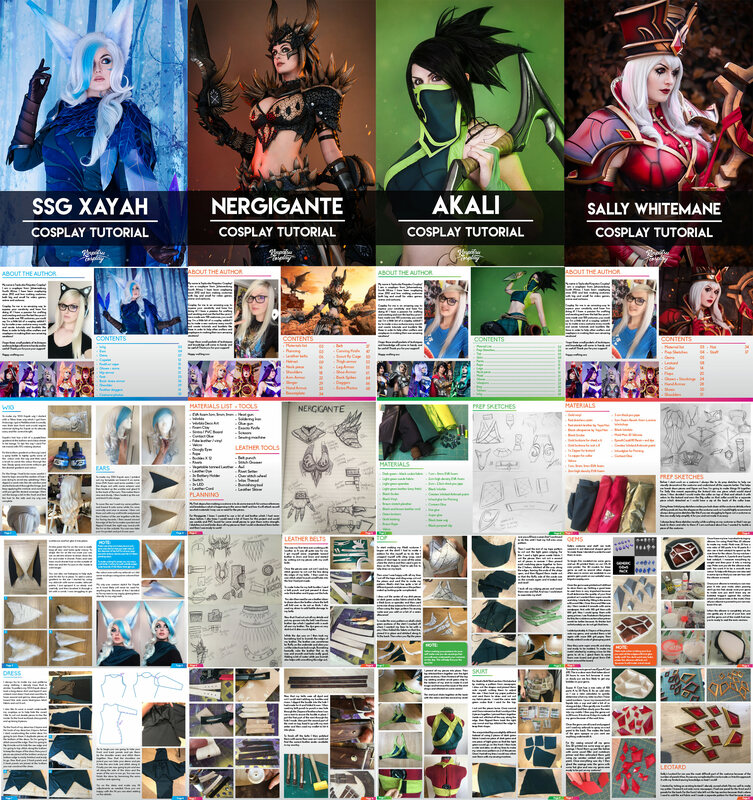 Every month I create a digital booklet showing how my costume is made from start to finish, I also do a video tutorial with full voice over and I send out a template for either a weapon or armor piece that patrons can use to help them with their own costumes. On patreon I also send out exclusive prints both A5 and A4, polaroids and even fansigns for my character that month! 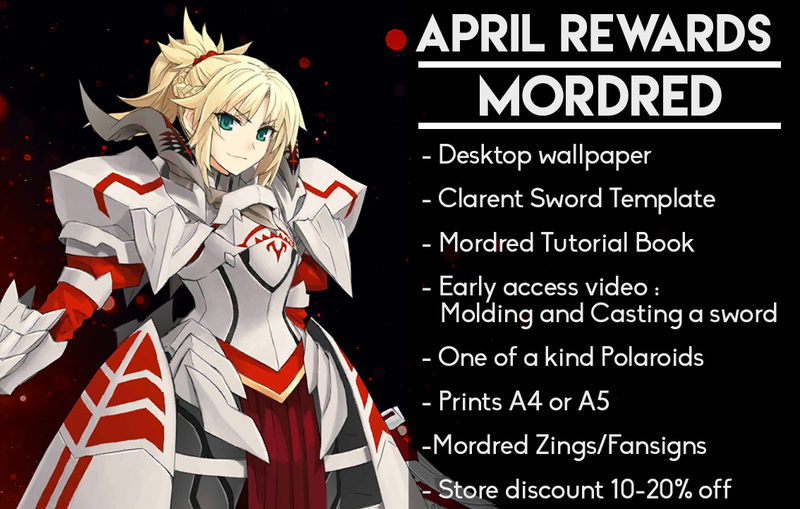 The rewards for this tier include a digital wallpaper of that months costume! You will also get a digital template that month for part of the cosplay I make, this normally a weapon template but sometimes it will be for an armor piece or an accessory. The final part of the rewards for this tier is the "Making of" PDF Booklet which details the whole build of the costume for that month. More info on the tutorial book is available further down! $10 tier : Video Tier! This tier is what I like to refer to as the video tier! It includes all the $5 rewards but then you also get 3 months of early access to my tutorial videos before they are published. This is the only place you can see them so far ahead of time :3 Videos will be accessible to current patrons in this tier and above. In this tier you will get a coupon that will give you 20% off in my store! In this tier you will get all the previous rewards as well a a patreon exclusive print from that month! In this tier you will get all the previous rewards as well a print from that month! Want more than just one print? In this tier you can get 2 x A5 prints for the characters I do that month! This tier is basically the same as the $20 tier BUT instead of just 1 print you will receive 2 prints along with all the other rewards! You will Receive everything from the previous tiers, the tutorials the 2 A4 prints and I will also send you a signed polaroid of my costume that month! The tutorial booklets are in depth tutorials which show the construction of my entire costume. They are normally between 20-40 pages long. If I do multiple smaller costumes in a month then I send out multiple smaller booklets for the characters. The booklets come with pictures of the steps as well as a typed explanation of how it was done. Here are some samples from some of my booklets I've made for Patreon. You will have access to any updates and some progress photos I post here! You will get access to a full write up on how my costumes are made which include in depth progress photos and steps, This will be put into a PDF and sent out at the end of each month. I will also send out a high res wallpaper for your desktop at the end of each month as well as a digital template from whatever costume I make that month. The store coupon will give you 10% off your purchase on my store! So if there are any tutorial packs, templates or patterns you missed you will get a discount on your order. The coupons are valid from the first of the month to the last day of the month and each month will have a unique code. - 3 Month Early Access to video tutorials! You will get all the rewards from the previous tier. You will also get a 20% off coupon to use in my store! Prints go out every 2nd month in batches. You will receive all rewards from the $10 tier as well as an A4 print for that month! In this tier you will recieve all the digital rewards as well as 2 A5 mini prints! This tier is exactly like the $25 tier but instead of 1 print you will receive 2 exclusive prints! prints are sent out in batches every second month. You will receive all the digital rewards, 2 A4 prints and I will send you a signed Polaroid of my costume that month! You will receive all the digital rewards, 2 prints and the Polaroid and I will also make a fansign for you in my costume from that month!